Whatever your age, you must plan carefully to help ensure your retirement dreams come true. This means building tax savings into your planning. For example, starting contributions early can make a big difference because of tax-deferred compounding. Choosing the right retirement plan for your situation is also important — is one that offers tax-deferred or tax-free savings better for you? Or perhaps you should contribute to both types of plans. Last, but certainly not least, avoiding early withdrawals and being tax-smart with required minimum distributions can be key to living your desired retirement lifestyle. Contributions are typically pretax, reducing your taxable income. Plan assets can grow tax-deferred — meaning you pay no incometax until you take distributions. Chart 4 shows the 2015 employee contribution limits. Because of tax-deferred compounding, increasing your contributions sooner rather than later can have a significant impact on the size of your nest egg at retirement. Employees age 50 or older can also make “catch-up” contributions, however. So if you didn’t contribute much when you were younger, this may allow you to partially make up for lost time. If your employer offers a match, at minimum contribute the amount necessary to get the maximum match so you don’t miss out on that “free” money. You’re a business owner or self-employed. You may be able to set up a plan that allows you to make much larger contributions than you could make to an employer-sponsored plan as an employee. You might not have to make 2015 contributions, or even set up the plan, before year end. SEP plans, for example, generally may be set up as late as the due date (including extensions) of your business’s income tax return for that year. Your employer doesn’t offer a retirement plan. Consider a traditional IRA. You can likely deduct your contributions, though your deduction may be limited if your spouse participates in an employer-sponsored plan. You can make 2015 contributions as late as April 18, 2016. 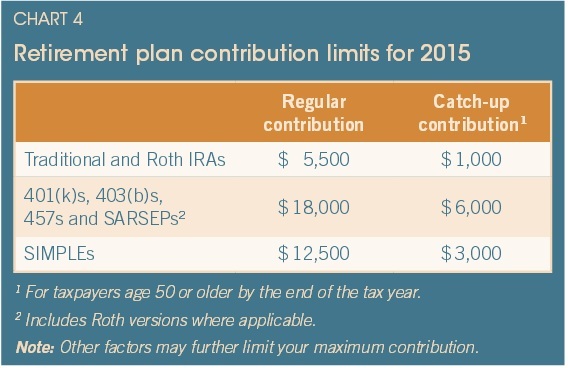 Your annual contribution limit (see Chart 4) is reduced by any Roth IRA contributions you make for the year. Roth IRAs. An income-based phaseout may reduce or eliminate your ability to contribute. But estate planning advantages are an added benefit: Unlike other retirement plans, Roth IRAs don’t require you to take distributions during your life, so you can let the entire balance grow tax-free over your lifetime for the benefit of your heirs. Roth conversions. If you have a traditional IRA, consider whether you might benefit from converting some or all of it to a Roth IRA. A conversion can allow you to turn tax-deferred future growth into tax-freegrowth and take advantage of a Roth IRA’s estate planning benefits. There’s no income-based limit on who can convert to a Roth IRA. But the converted amount is taxable in the year of the conversion. Joe is deciding whether to convert his $50,000 traditional IRA to a Roth IRA. He wonders why he would want to pay the tax today at his 25% tax rate. After all, he reasons, that’s $12,500 he’d be out of pocket now. Joe is 40 years old and anticipates not having to use his IRA funds in retirement. Given the fact that the Roth IRA isn’t subject to minimum distribution requirements (unless the account is inherited), Joe may be a good candidate for a Roth conversion. Over the years, his $50,000 account could grow to become a much larger amount, and all qualified distributions would be tax-free. If Joe were 60 years old, the Roth conversion might still make sense, especially if he wanted to transfer his IRA to his children without their being subject to income tax on the distributions. See Case Study IV for an example of these considerations in action. “Back door” Roth IRAs. If the income-based phaseout prevents you from making Roth IRA contributions and you don’t have a traditional IRA, consider setting up a traditional account and making a nondeductible contribution to it. You can then convert the traditional account to a Roth account with minimal tax impact. Roth 401(k), Roth 403(b), and Roth 457 plans. Employers may offer one of these in addition to the traditional, tax-deferred version. You may make some or all of your contributions to the Roth plan, but any employer match will be made to the traditional plan. No income-based phaseout applies, so even high-income taxpayers can contribute. Plans can now more broadly permit employees to convert some or all of their existing traditional plan to a Roth plan. Early withdrawals from retirement plans should be a last resort. With a few exceptions, distributions before age 591/2 are subject to a 10% penalty on top of any income tax that ordinarily would be due on a withdrawal. Additionally, you’ll lose the potential tax-deferred future growth on the withdrawn amount. If you must make an early withdrawal and you have a Roth account, consider withdrawing from that. You can withdraw up to your contribution amount without incurring taxes or penalties. Another option: If your employer-sponsored plan allows it, take a plan loan. You’ll have to pay it back with interest and make regular principal payments, but you won’t be subject to current taxes or penalties. Early distribution rules also become important if you change jobs or retire and receive a lump-sum retirement plan distribution. You should request a direct rollover from your old plan to your new plan or IRA. Otherwise, you’ll need to make an indirect rollover within 60 days to avoid tax and potential penalties. Warning: If you don’t do a direct rollover, the check you receive from your old plan may be net of 20% federal income tax withholding. If you don’t roll over the gross amount (making up for the withheld amount with other funds), you’ll be subject to income tax — and potentially the 10% penalty — on the difference. After you reach age 70 1/2, you must take annual required minimum distributions (RMDs) from your IRAs (except Roth IRAs) and, generally, from your defined contribution plans. If you don’t comply, you can owe a penalty equal to 50% of the amount you should have withdrawn but didn’t. You can avoid the RMD rule for a non-IRA Roth plan by rolling the funds into a Roth IRA. Waiting to take distributions until age 701/2 generally is advantageous because of tax-deferred compounding. But a distribution (or larger distribution) in a year your tax bracket is low may save tax. Be sure, however, to consider the lost future tax-deferred growth and, if applicable, whether the distribution could: 1) cause Social Security payments to become taxable, 2) increase income-based Medicare premiums and prescription drug charges, or 3) affect tax breaks with income-based limits.